Jeweler Paige DiScenza did not know the effect one Jewelry Show would have on dozens of women with chronic illnesses. After Debby Hansard, from Canton Georgia, attended her show in November of 2014, they both learned the power of kindness and courage, and created an amazing support group for women who needed it most. Debby battles with short bowel syndrome, a chronic illness that requires her to have an IV every night for 10 hours. She has found support through a Facebook group consisting of people with this rare illness. She said she went to her friend’s show to be polite and did not plan to do much shopping. While flipping through the catalog, Debby came across a bracelet that was different from her usual taste in jewelry, and she couldn’t get it out of her mind. It was the Premier Designs Courage Bracelet. 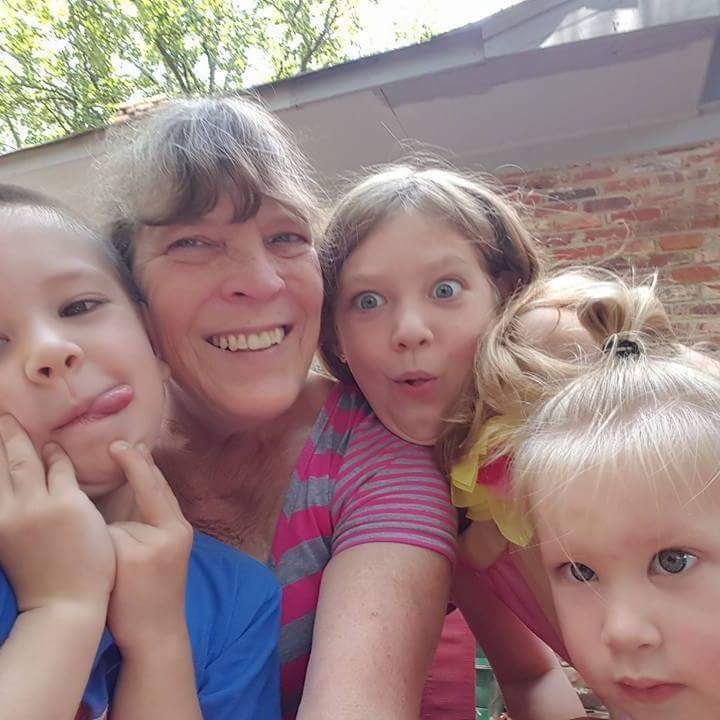 Debbie loves spending time with her grandchildren! Even though it seemed like an odd choice for her, Debby ordered the bracelet and her connection to it grew. Before her order arrived, she studied the picture of the bracelet, and its meaning came into focus. “It became, ‘I need this bracelet,’” Debby said. To her each element of the bracelet has special significance. The pink stone symbolizes her femininity. The silver shines, which reminds her that she does as well. The ribbon represents the battle with chronic illness and reminds her that it’s ok if she’s having a bad day or not feeling well. The heart is a reminder that she is loved, and the word courage represents her strength and the courage she has to fight her disease. 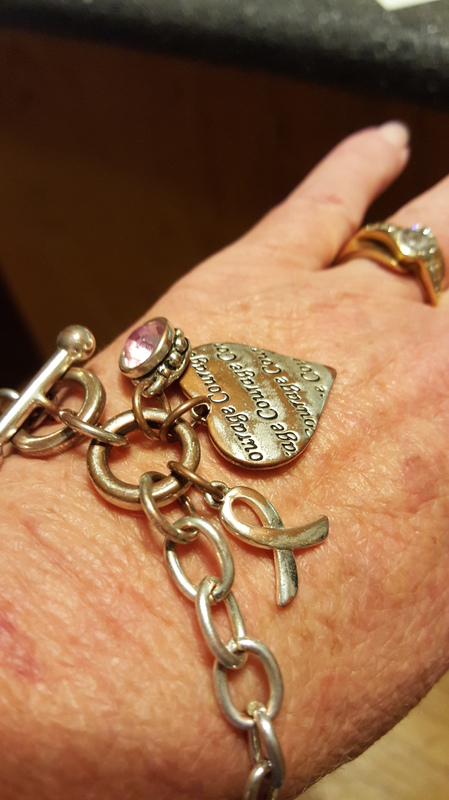 The Courage bracelet had such a strong meaning and impact on Debby’s life that she felt moved to share it with others battling her same illness. In December of 2014, she hosted her own Jewelry Show hoping to earn four bracelets to give away. Everyone at her show, especially Paige, wanted to help her reach her goal. Some guests even offered to buy the bracelets Debby didn’t earn. However, that wasn’t necessary—she earned eight bracelets that day! Debby sent a bracelet and a letter to four women with chronic illness. The letter described Debby’s situation and the significance of the bracelet. She then asked those four women to pick someone else to receive a bracelet. “The responses were amazing,” Debby said. Each woman told her they were struggling on the day they received the bracelet, and it brightened their day, giving them encouragement and hope. Calls, texts, a nd emails have poured in, thankful for the kindness and encouragement. Debby and Paige share their stories and stay in touch with these women, giving and receiving support. One woman received the bracelet the same day she was scheduled to have surgery. She called Debby to say thank you and let her know how worried she was about her surgery. The nurses pinned her bracelet inside her pillow during surgery, and it was with her the whole time. Debby said she made it through surgery and is already doing better. “The women wear the bracelet every day,” Debby said. The women who have received the bracelet have formed a strong connection to it just like Debby, drawing courage from its significance. They’ve also stayed in touch, creating a support system of women with similar situations and helping each other through difficult times. Since her Jewelry Show, Debby has given away about 12 bracelets. However, her kindness and encouragement has sparked something much bigger. Other women are also sharing the Courage bracelet, and about 25 have been shared this year. “It’s blown up. The women who have the bracelet share it with others,” Debby said, amazed at the effect the Courage bracelet has had on so many women. Paige supports Debby’s efforts whole-heartedly, selling Debby the Courage bracelets at cost. And, even though some have offered to buy the bracelets for her, Debby prefers to do it herself as much as possible. For her, it’s all about connecting with these women and making a difference in their lives. As a Jeweler since the end of January 2015 and an extremely satisfied customer for years, this post warms my heart and truly Encourages me. This is a great story. Very timely read. Thank you for sharing! Awesome story. Thank you for your kindness and love to others. Love this❣ I had a dear friend with breast cancer so I gave her one, but I never thought of giving it to others with illnesses for courage and strength. I have another friend who just foud out she has a rare blood cancer. She is so young, beautiful, and has very young children.